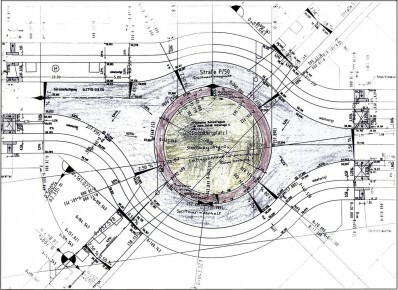 The proposal takes the street construction plan for the Lossebergplatz literally and suggests the realization of the given plan aesthetics 1:1 as a ground-level sculpture. It is a walk-on and drive-over plan in the public space of Karow-Nord. The green and red inkpen surfaces in the plan will be realized in detail. 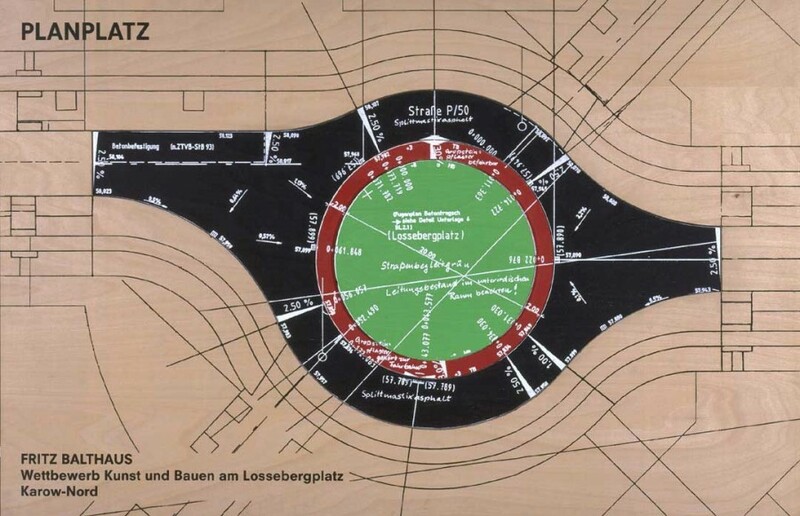 In the green, red and white of the then concretely realized plan enormous script types will appear next to handwritten notes such as: Straßenbegleitgrün (green next to street), Großsteinpflaster gehört zur Fahrbahn (large cobblestones belong to the streetlane), or Splittmastixasphalt (gravel asphalt). Even the plan’s technical symbols such as columns of numbers, material notes, etc. will all be imprinted to scale into the reality of the square. In this life-sized urban in-lay the plan is matched in the reality of the square. The proposal is a reference to the totality of plans for the new housing complex, a superficial theme park of architecture and construction styles from the last century. The constructability of known architectural surroundings, made easier and forced upon us through computer capabilities, and the constructability of reliable atmospheres leave the passers-by in a feeling of homely discomfort. The cause of this can be identified with a planning symbol in urban space: ‘Planplatz’.